From soba to po’ boys to fancy vegetarian food, a guide to our favorite places in the neighborhood. Why is it that Clinton Street Baking Company resembles a crowded subway car on the weekends? Ridiculous pancakes, obviously. During brunch hours, it’s not uncommon for people to wait two hours for the pure, fluffy cakes of ecstasy that this place is known for. We won’t join them...but we can’t blame them either. The pancakes alone make this place a top Chronic Brunch venue in Manhattan. After being told there was a long wait for brunch at 3:30pm on a Saturday a few years back, CSBC was officially relegated to an afterthought for us. Maybe if they were handing out freshly baked goods on the street, it’d be worth waiting around, but they don’t, so coming here on a weekend is completely out of the question. Like you, we don’t have that kind of time to waste. But those pancakes can only remain an afterthought for so long. We had recently been thinking about those big beautiful things a whole lot, and it was time for a fix without the wait. Weekday breakfast was the move, and hot damn, was it ever. Talk about starting the day off right. The place is close enough to the F train to be convenient to Midtown, and a weekday meal means you aren’t waiting around like a crazy person. Book a breakfast meeting just for the hell of it. 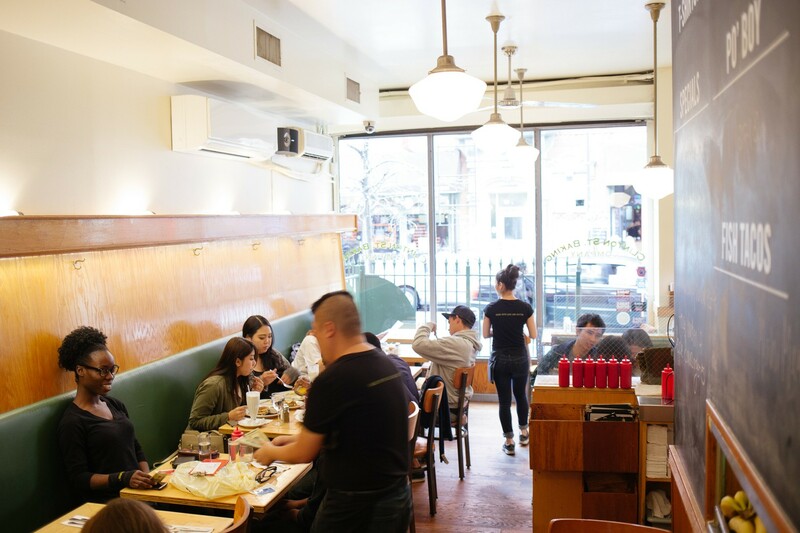 For those living on the Lower East Side or EastVillage,Clinton St. Baking Company is also a useful lunch and dinner standby, delivering quality food across the board. It’s a charming little establishment, family owned and operated by a husband and wife team who put that little extra love into their food to make you remember it and want to come back. We’ve discussed these enough. The pancakes here are incredible. Favorites include blueberry, chocolate chunk, and banana walnut. Another one of our favorite brunch orders: three eggs, chorizo, tomatoes, caramelized onions, scallions, melted monterey jack, with hash browns and sourdough toast. Delicious. They make an excellent hollandaise at Clinton St. - definitely feel free to order up the benedict. Poached eggs and grilled ham with sauce over their homemade, toasted buttermilk biscuit. Damn straight. This is a pretty damn good egg sandwich on a toasted biscuit. Proceed. Brioche french toast + caramelized bananas + roasted pecans + warm maple butter = definition of Chronic Brunch. It’s always on the menu, and for good reason. Served with bacon, lettuce, tomato, avocado, and chipotle mayo on a toasted roll, this is a fine sandwich. You won’t leave hungry. Monday through Thursday, there’s a $12 burger and beer special from 6-8pm which we’ve been known to hit up every once in a while. The burger is pretty standard - a nice patty with swiss or cheddar and caramelized sweet onions on a toasted brioche bun, with chips and slaw. Not a bad option dinner option if you live in the hood. Dinner time is fried chicken time at Clinton St. Baking Company. It’s not on the same level as some of our favorites, but this is still a high quality piece of crispy, juicy chicken. Order with confidence. Always save room for dessert, especially here. The “classic’” hot fudge sundae is awesome. Homemade hot fudge, whipped cream, and real chocolate sprinkles. Just like the old days at Friendly’s. Trapizzino is a casual Italian restaurant on the LES serving pizza dough pockets with a bunch of different fillings. Davelle is an all-day Japanese spot on the LES that’s unlike any other place in the city. Freemans has been a key player in the restaurant renaissance we’re currently living in and ranks among our favorite restaurants of all time. A smaller, very casual Lower East Side outpost of Brooklyn’s Speedy Romeo. They may be known for pizza, but that’s not the best thing here. Community Food & Juice is one of the best brunch spots around Morningside Heights and Columbia University. Unfortunately, that's exactly when it's at its worst. Hit it any other time for best results. The Upper West Side may not be flush with noteworthy dining out options, but they certainly have one meal on lockdown – brunch. Good Enough To Eat has been an institution up in these parts for a good 30 years, and a spot we'll happily go to for simple, heavy handed home cooking. Bricia is a casual Italian restaurant on the Lower East Side with great homemade pasta.